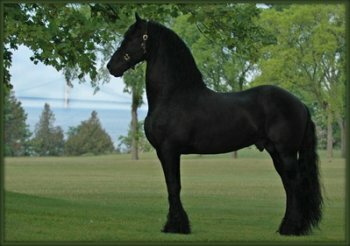 Friesian Horse Photos show the beauty and elegance of this wonderful breed. This is the Mackinac story of Regina, Nanning and Lincoln van Nanning. Born in 1997 in the Netherlands, Regina G.B. was imported into the United States in 2002. 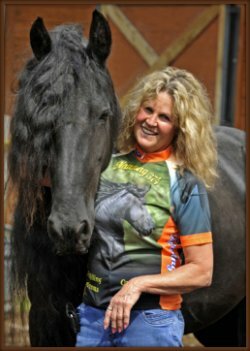 She received her “Ster” designation at her keuring, meaning according to her confirmation and movement she is in the top caliber of the Friesian Breed. Maryanke Alexander purchased Regina in June of 2006 and within two weeks brought her to Mackinac Island! The two definitely had a quick study in trust and learning the Island ways! Regina has been to the Island every summer since where she has won the English Grand Champion at the Mackinac Island Horse Show, participated in the Lilac Parade – winning an award, and of course performed at the Festival of the Horse for two years. When she is not on the Island she is home with Maryanke or in dressage training at Maryanke’s trainers barn. Maryanke has competed successfully with her at A rated dressage shows, competing at 1st level. Her sire, Oege, is famous in the Friesian world as producing top quality offspring and many approved Dutch Friesian Stallions. Nanning, Lincoln’s sire, is a statuesque 17 hands tall, one of the tallest approved stallions in North America. In mid 2000, he won the champion ribbon in his prestigious stallion competition. As determined by the FPS, Nanning 374 received permanent breeding rights due to his proven record of consistently producing foals of the highest quality. In June of 2007, Nanning came to Mackinac Island for an unprecedented photo shoot! He was the first Stallion to spend time on Mackinac Island in over 54 years! Nanning’s photos on Mackinac Island have been showcased around the world. Unfortunately Nanning passed away in June of 2010.
on in his offspring, including Lincoln van Nanning, born at 6:50pm on May 10, 2011. 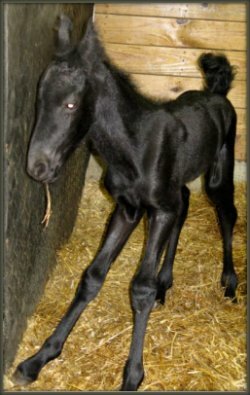 Lincoln is the product of two outstanding Friesians, Regina and Nanning, who have graced Mackinac Island. If you would like to see Friesians up close and personal, be sure to attend the Festival of the Horse. It is an annual event held in August. You will see these horses in parades as well as in certain demonstrations throughout the event. They are truly beautiful! Read more about the love of Horses on Mackinac Island. Take a Carriage ride around the Island...it's fun and relaxing.